The African Studies Association is pleased to announce that they are accepting nominations for the following awards and prizes in 2019. All applications are due April 30, 2019. The ASA Book Prize (Herskovits Prize) is awarded to the author of the most important scholarly work in African studies published in English during the preceding year.. The ASA Program Cover Art Prize recognizes the best artwork submitted that directly addresses the Annual Meeting theme. This year’s theme is “Being, Belonging, and Becoming in Africa”. The ASA Film Prize recognizes an outstanding film, whether fiction or documentary, made in the preceding two calendar years by an African filmmaker. The Bethwell A. Ogot Book Prize is awarded to the author of the best book on East African Studies published in the previous calendar year. The Distinguished Africanist Award recognizes a lifetime of distinguished contributions to African studies. Deadline for nominations: April 30. The Paul Hair Prize is presented every two years and is awarded to the best critical edition or translation into English of primary source materials on Africa published during the preceding two years. The Gretchen Walsh Book Donation Award offers an annual grant program to assist book donation projects with shipping costs to send books to African libraries and schools. I learned of Marshall Ward Mount’s November 25, 2018 passing from my aunt this past January. A Jersey City native, like Marshall, she had been thrilled by my first visit to the storied Mount home more than twelve years ago. The opportunity to view the African art collection he had amassed over decades of research travel to the continent made a lasting impression. While enrolled in Professor Mount’s Arts of Africa course as an undergraduate at New York University, I, along with hundreds of students from Marshall’s six decades of teaching, was exposed to the history of African art for the first time. His passion and enthusiasm for the subject impressed me. His personal attachments to the objects, to their lives and stories intrigued me. The box of Paul Wingert’s African art prints that I purchased for the class still sits on my bookshelf – a reminder of my introduction to a canon of objects that I’ve since learned to deconstruct, complicate and expand. Some of that crucial work began by later reading Marshall’s own book, African Art: The Years Since 1920 (1973), the research for which he received a Rockefeller Foundation Fellowship as a student of Paul Wingert’s at Columbia University. This book is integral to the historiography of modern and contemporary African art history. With a generous and encouraging spirit, Marshall eagerly supported me in the early stages of my career. He introduced me to individuals whose own generosity made the pursuit of a life in art history seem possible. As I look back through my correspondence with Marshall, I am reminded of just how significant his support was to my own growth in this field. I visited Marshall and his wife Caroline’s Jersey City home for a second time while research assistant for the Arts of Africa collection at the Newark Museum. Beyond the thrill of viewing his collection with more discerning eyes, I remember Marshall’s stories. In one, he joyfully recounted his return from one of his first trips to the African continent. With a twinkle of mischief in his eye, he recalled the moth infestation that took hold in his mother’s home when he opened the crates of art and textiles he brought back from his trip, an inevitable inconvenience of the journey. Through his collecting and teaching, Marshall allowed me, and so many others, to witness firsthand the ways African objects and narratives have been mobilized to take root in the cultural imagination, both far and very near. He brought African art “home” for me as a fellow New Jerseyan and opened my eyes to the world right outside my door. Donations may be made in Marshall Ward Mount’s memory to the African Wildlife Fund. 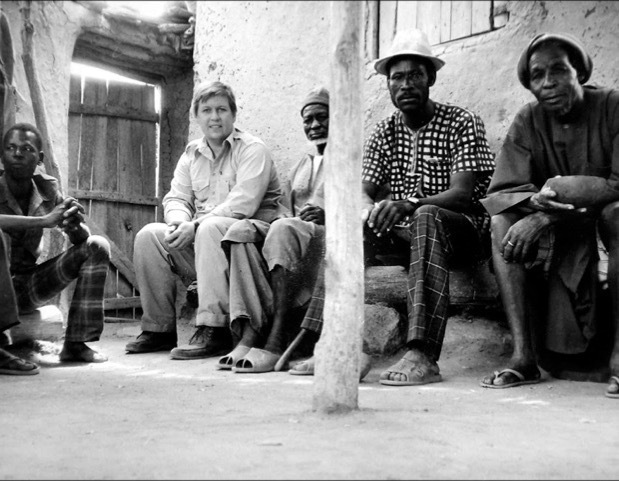 Picture taken by Nora Leonard Roy at Ouri, Burkina Faso, ca. 1985. Today we mourn the loss of an extraordinary man. Professor Christopher Damon Roy passed away early on the morning of Sunday, February 10 in Iowa City, surrounded by his immediate family. Chris was born September 30, 1947, in Ogdensburg, New York, to Margaret Adam Snow and George Robert Roy. He and his wife, Nora Leonard Roy, were married at the Hôtel de Ville, Ouagadougou, Upper Volta, on September 26, 1970. He leaves his beloved wife, Nora; his son, Nicholas Spencer Roy (Jill Scott); his daughter, Megan Deirdre Roy (John Dolci), and granddaughter, Sylvia Elizabeth Dolci; his sister, Robin Roy Katz (Michael Katz) and nephew Teddy Katz; his brother, Matthew Roy (Caroline Darlington Roy); nieces Katelin and Emily, and nephews Robby and Chris. Those close to Chris will remember him well for his sincere warmth, delightful wit, and bold sense of humor. Always approaching life with a sense of adventure, his robust energy and fascination with the world was contagious during his forty-one years at the University of Iowa. Throughout his career, Chris devoted much of his attention to the arts of Burkina Faso and the Max and Betty Stanley Collection of African art. His writing on the Thomas G.B. Wheelock Collection is well known, and many will remember him for his catalog on the Bareiss Family Collection. Over the years, he contributed regularly to African Arts, where he published on his research in Burkina, reviewed exhibitions, and engaged in current debates. His 1980 review of Traditional Sculpture from Upper Volta remains one of the sharpest critiques in the field. In 2015, he published his most recent book, Mossi: Diversity in the Art of a West African People,as well as an essay, “The Art Market in Burkina Faso: A Personal Recollection,” included in Silvia Forni and Christopher Steiner’s Africa in the Market: Twentieth-Century Art from the Amrad Collection. His Art of the Upper Volta Rivers (1987) remains a standard text on the subject. In addition to this, Chris produced over twenty self-narrated video recordings on the arts of Africa, and all are freely accessibly online. He and Linda McIntyre released Art & Life in Africa (ALA) as a CD-ROM in 1997 and sold thousands of copies throughout North America. In 2014, he worked with Dr. Catherine Hale and Cory Gundlach to redevelop ALA as a website, which has had nearly 500,000 users. As a leader in his field, Chris founded and directed the UI Project for Advanced Study of Art and Life in Africa (PASALA), which provided scholarships for graduate course work and research in Africa, as well as conferences and publications on African art. Chris’s impact as a professor was no less remarkable. Every fall semester, twice a week, nearly 300 students packed the largest lecture hall at Art Building West to attend his survey course on African art. High enrollment was common for his all courses, as he was a gifted storyteller and he understood the power of keeping his students entertained with occasional humor. A long history of work with the Stanley Museum of Art supported his object-oriented approach to teaching, which he complemented with a social history of art. He oversaw the completion of fifteen doctoral dissertations, and many of his former students are now employed in major institutions throughout the country. From 1985 to 1995 at the Stanley Museum of Art, Chris served as curator of the arts of Africa, the Pacific, and Pre-Columbian America. He curated fourteen exhibitions during his university career among museums in Iowa, China, Austria, and Germany. Scholars reviewed his exhibitions at the Stanley Museum positively for the way in which artistic quality drove his motivations for selection and display, and for the way in which he treated attribution carefully. Beyond his scholarship, teaching, multi-media projects and exhibitions, Chris’s YouTube videos on art and life in Africa have reached perhaps the widest audience, with more than 10,000 subscribers and over four million viewers worldwide. It is encouraging to think that the world is a better place because of Chris and all of those touched by his warmth and brilliance. To contribute to the Christopher D. Roy Memorial Fund, go to www.givetoiowa.org/2019la98. This fund will give UI art history students the opportunity to gain valuable intern experience at the Stanley Museum of Art. It is difficult to speak about Bisi in the past tense! Bisi Silva was born in Lagos in 1962 and died on the 12 of February, 2019. She was the founder and artistic director of the Centre for Contemporary Arts, Lagos established in 2007. In the 11 years of its existence, her Centre became ‘the’ Centre of art in Nigeria. Bisi centred the discourse on contemporary African art on the continent and brought several international scholars, artists and curators to Nigeria. Her Centre became a gateway for establishing connections between local artists and international audiences. It brought joy, laughter and professional fulfilment to many. Bisi lived a short but purposeful life. She brought to the art scene a high-level of professionalism and impacted both young and old artists through her unique exhibitions and artists talks/programmes. She was a scholar and curator extraordinaire and internationally recognised for her immense contribution to art scholarship. She developed the art of photography, video art and other aspects of new media which were largely underserved in Nigeria at the time. She transformed the careers of a good number of artists and curators from all over the world. 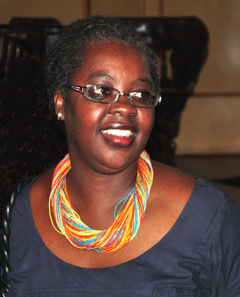 She will be fondly remembered for the Asiko curatorial school. At home, Bisi made it possible for young art graduates to think of establishing careers as curators. She supported several art programmes in different parts of Nigeria and endowed prizes for the best entries in the arts at national competitions. She made donations to many art programmes and projects. Bisi curated several local and international exhibitions and biennales, too numerous to mention here. Bisi was simple, kind hearted and generous. She was beautiful, well spoken, talented, focused, bold and fearless. She spoke strongly against mediocrity and disrespect for women and expressed her views freely. She was a lover of books. She developed the most comprehensive library of art books in the country. The Centre and library located in Yaba, Lagos was in close proximity to the major art schools in Lagos which made it accessible to many college students. Indeed, the Centre benefited from this pool of students who served in different capacities in administering it. Despite her busy schedule, she found time to give lectures in schools, carry out portfolio reviews and visit exhibition and talks. Here was a scholar who gave her all to the development of art in Nigeria. What a life full of achievements! She will be missed by the global community of artists. Asiko, the name of her curatorial project means time. Her time is up, but her legacy continues! Olabisi Silva, Odigba, Sun re o. Rest in peace. Friends, by now you may have heard the very sad news: Polly Nooter Roberts has passed. She went peacefully in her sleep the night of September 11-12 after living with stage four metastatic breast cancer (MBC) for more than eight years. She is mother to three and grandmother, daughter of Nancy and Robert H. Nooter, and the loving wife of Dr. Allen Roberts, with whom she regularly forged new research. We extend our deep sympathies to the Nooter and Roberts families. A recipient of ACASA’s 2017 Leadership Award, Dr. Mary (Polly) Nooter Roberts was a giant in the field of African Arts. She was Professor of World Arts and Cultures at UCLA and Consulting Curator for African Arts at the Los Angeles County Museum of Art (LACMA). She brought a deep appreciation for artistic achievement to her work and great sensitivity to the weight of history on people’s lives. Her brilliant research spanned the continent and its diasporas, but she is best known for concentrated studies of Luba art in the DRC and Sufi arts in Senegal. Institutions and even nations awarded Polly’s ability to translate philosophy, history, and art; strikingly, in 2007 she was decorated as a Knight in the Order of Arts and Letters by the Republic of France for her promotion of francophone African art. She served ACASA as President and brought our Triennial to the island of St. Thomas, our first venue outside of North America, in 2001. The volume and value of her work is so great that it is impossible to summarize here. Her legacy to critical curatorial practice is profound. Polly lived a life of purpose and was widely known for her generosity. She described her illness as a “detour” in life and saw it as an opportunity for growth. A leader by nature, Polly embraced the opportunity to advance the research of Simms/Mann UCLA Center for Oncology and aid the community of women living with MBC in Los Angeles. She brought the same positive energy to those endeavors that she brought to our wide community. Polly radiated warmth. She gave each person her undivided attention, respecting the moment that an encounter offers, and she brought out the best in each of us. She was a woman of grace, poise, and elegance. We will miss her. The Arts Council of the African Studies Association (ACASA) is inviting members to submit items for the Fall 2018 association newsletter. Items may include announcements for conferences and symposia, calls for papers and proposals, exhibitions, current publications and resources, member news, and upcoming events. DUE DATE: COB September 14, 2018. Note:Candidate Statements for new Board positions will be available in this issue. Please send all submissions to Deborah Stokes at Deborah.Stokes@icloud.com or Leslie Rabine at lwrabine@gmail.com. CAA has announced a Call for Participation in Sessions Soliciting Contributors for the 2019 Annual Conference. See here for panels that directly mention Africa in the abstract. View the entire CFP here. 250-words abstracts to be sent to the panel chairs by August 6th. All speakers notified by August 30th. On behalf of our members and in the strongest possible terms, the Board of the Arts Council of the African Studies Association (ACASA) denounces President Donald J. Trump as a racist. His recent profanity directed at Africans and Haitians, well publicized and too grotesque to repeat, is the latest in a long string of racist remarks and actions to which we are vehemently opposed. Our members know well the vast, invaluable contribution that African men and women have made, in the arts and well beyond, throughout human history and the world over. Although we are not surprised that President Trump denigrates Africans – he has fomented racism since he first entered the public eye in the 1970s – this week’s characterization of Africans and Haitians is deeply offensive and needs to be called out. So, too, do we condemn those US elected officials who do not publicly stand opposed to racism and do not denounce President Trump as racist. Silence is compliance. We speak against racism and to those who remain silent since both contradict our mission, which is to facilitate communication about African history and expressive cultures and to promote greater understanding of these worldwide. Finally, this: The global economy from which Americans benefit was built by immigrants including millions violently enslaved and displaced to the Americas, whose forced labor ensured wealth for others. The United States owes much to their indomitable creative spirit since many of its most celebrated forms of artistic expression descend from Africans. We call on all American ACASA members and friends to vote next November 6 for candidates who respect the lives of every person. If you are interested in ACASA but have not yet joined us, please do! The final 2017 ACASA program schedule is now available.